Oops, I did it again... I bought another expensive nail polish. In my defence, this is only my second Chanel nail polish, so I have been selective about what I spent this kind of moolah on, but really - nearly $30 for a nail polish is indeed excessive and completely unnecessary. But this colour, though. I had nothing like it, and saw online that the formula was really quite good. I was feeling spendy, so along with another Chanel item, I splurged at Murale. 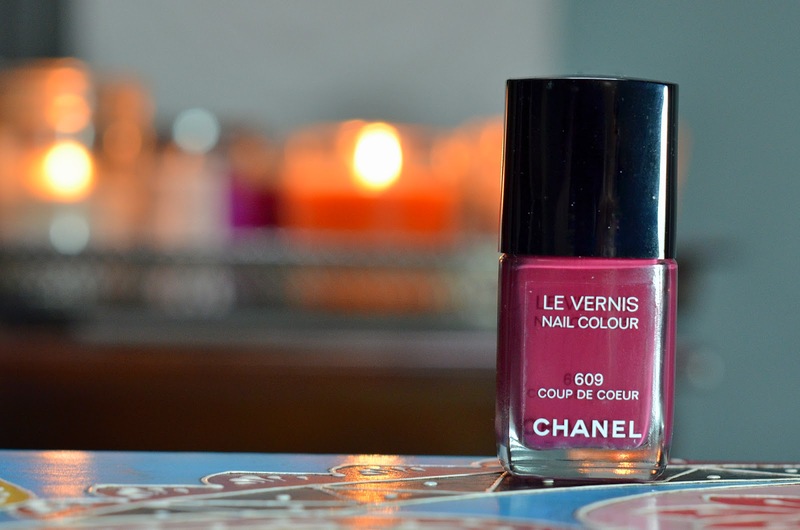 Chanel's Coup de Coeur is a beautiful, rich raspberry. It's smack in the middle between red and pink, so it goes with absolutely everything, while being incredibly chic. I'm kind of obsessed. I have to say that I'm not typically a red/solid pink nails kind of girl... I usually go for neutrals, or my trusty Chanel Graphite, but this is so classic I just had to go for it. And surprise, surprise, I love how it looks on my nails! The formula really is excellent. It applied evenly and was nearly opaque in one coat - I did two out of habit, but one would have been fine if I were in a time crunch! No streaking at all, and no pooling. It was a pleasure to use! Now if only my cuticles would get their ish together and cooperate. I just bought some of that Sally Hansen Cuticle Remover magic potion, and it seems to work okay, so hopefully my pitiful cuticle situation will be remedied by the next NOTD post. I also have some NailHQ goodies that I'm trying out right now, so I'm generally optimistic about the future of my nails... Except I don't think I will ever get over my obsessive picking habit, so there's that. That is a very beautiful colour! It's so classy-chic. Love it! A New Favourite, Hidden Gem, etc.